When you blow up the personal vehicle of someone who has a bounty on their head you will not get charged for their insurance excess. You will still get a bad sport warning though! If you steal a car from a NPC note that they can and will sometimes put a bounty on your head too. It’s not just other human players that can do it! When doing the mission “Out of Court Settlement” you should intentially fail it by storing the $22K vehicle in your garage, and then you’ll be able to immediately grab another one. Then it’s simply a case of using all the spaces available in your garage and proceeding to pass the mission. If you have another player in your car as the passenger and they set a point on their GPS it will automatically be shown on your GPS map too. Passive mode is entered by going to the pause menu, then Online –> Options –> Passive Mode. While you can’t be killed by getting shot by another person on foot, or robbed during passive mode, you can get run over by someone else with a car and also shot by someone from a car. So be careful where you choose to activate it. It will also cost you $100 to enter. If you want to change your “personal vehicle” you need to acquire/steal the one you want (not a premium one though) and take it to Los Santos Customs. Then go to “Loss/Theft Prevention” and buy the tracker for $2K. This will make it your default vehicle. One of the benefits of having a personal vehicle is that you can get it back really quickly. If you’re in free roam and it’s a long way away then go to your phone and accept a job (or so a quick one) and your vehicle will be transported to you. You don’t even need to finish (or even start the job) and can just cancel it. X on the Xbox 360 or Square on the PS3 is how you cancel jobs from the job selection screen on the cell phone. If you’re looking for some ideas as to how to respray your vehicles then look no further than the imgur gallery linked below as well as the color combos that follow! Once you’ve built up a bit of cash in GTA Online (LINK TO HINTS) you’ll probably want to spend it on property. Luckily we have a nice spreadsheet embedded below (click for the full sized version) that will show you all the property you can purchase in GTA Online along with the type, location, region, price and garage size of each. Very handy! You need to have enough cash for the car you want. Ensure your garage is full. Go buy the car but sit on the screen where you are meant to select which of your current cars you want to replace. Press pause and go to the PS or Xbox games store. It should start loading and the screen should begin zooming out to the clouds. This is when you need to press A twice (Xbox 360) or X twice (PS3). You should hear the “car purchased” sound. After the store loads just back out of it and head to your garage. You should have your new car for free! When you have assigned an action like eating a snack to the quick action button (which can be activated by pressing in both sticks (ie L3 and R3) then make sure you are fully pressing and holding the two sticks in so that your character completely consumes the snack/bottle/whatever she or he is eating or drinking. This will ensure you get the full benefit of its effects. If there are some blue moving objects on your minimap that aren’t being auto-tracked by the GPS, you can switch to Quick GPS and they’ll appear. The Quick Menu in GTA Online is very important. Access it by holding “Select” or “Back”. It is where you can change clothes and accessories, start a race, change your vehicle settings (like deciding who can enter and who can’t) and also enter passive mode. If you press RT (Xbox 360) or R2 (PS3) after everyone has liked (or not) the previously played mission you can vote to replay it. This works even if the option to replay the mission is not displayed on the screen. You’ll need to have access to multi-car garages in order to do this, but it’s really useful. What you need to do is try to obtain and then mod at least one type of each vehicle that there is. This way whenever you go to race with others, you can have a custom modded car no matter the vehicle class chosen. Reddit user no1dead was kidn enough to create Spotify playlists for all the radio stations in GTAV! Simply click the link below to be taken to the relevant playlist in your Spotify app. If you stop the pilot of a Merryweather Helicopter (you need to be level 10 to unlock the chopper pickup) at a low altitude then a prompt should show up. You can dictate where it stop by setting a waypoint while you’re in the chopper. Then hold X on the Xbox 360 (Square on the PS3) and you’ll be able to rapple from the copter. The Rat Loader might look cool, but it’s an absolute dog to try and drive. Anyway, it’s still good for cruising around in and if you want to find it in GTA Online then check this video for the spawn location. Follow these steps to rearrange the vehicles in your garage without losing them! Your garage must be full with at least one car you don’t mind losing. Get in the car you want to move and drive out of the garage. Go to phone, internet and order any new car (maybe the free Elegy?). When you order you’ll be asked which car you want to replace. Choose the one your sitting in. Wait until you get the text saying your new car has arrived. Drive into your garage in the car you were meant to replace. When you do you will be asked which car you want to replace and can drive into any garage parking spot you like. The car you choose will be deleted. Head to the in-game menu and from there select “Info” where you’ll be able to track all your recent activity, including who you’ve played with. This can be an excellent way to recall who shot/robbed/punked you in-game. Use it to track them down and exact your revenge! To get rid of your Wanted Level simply drive into an auto-shop!! If you’re going to replace a vehicle in your garage then make sure you carry out the replacement first and only after it’s been saved in your garage take it out and mod it. Otherwise if you mod it first and then use it to replace the old car you can lose the mods! You can either select to replay it from the mission selection screen after a mission ends. If you’ve already gone back into free roam you need to call Gerald and ask him for a job. Do the job he gives you and then choose your mission on the selection screen. Ask/wait for another player to give you an invite to do the mission. You might not think you can, but it’s actually possible to re-supply with more armor, health and ammo half-way through completing a job. So if you get low on ammo or health, or need to get more armor in anticipation of a big gun fight, visit an Ammu-nation to restock and then carry on with the job. 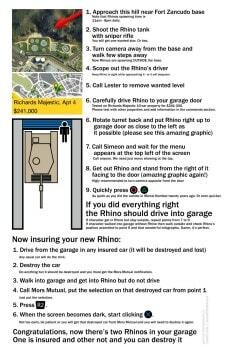 Follow the guide in the image below in order to grab a Rhino tank in GTA Online AND insure it and store it in your garage!